Audrey McDonald Atkins grew up in a small, rural town in South Alabama. As an adult, she realized how many of the experiences she had as a child have influenced her view of the world in general and life in the South in particular. 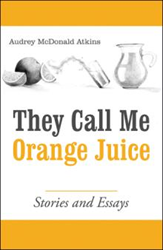 These childhood experiences inspired Atkins to write “They Call Me Orange Juice: Stories and Essays” (published by Archway Publishing). For more details about the book, visit https://www.amazon.com/They-Call-Me-Orange-Juice/dp/1480859419. The book shares a collection of stories and essays that provides a nostalgic, poignant and often-hilarious look at growing up in a small South Alabama town and how that upbringing still influences Atkins today. She recounts stories about the men who congregated in the police station and the eccentric characters who worked on Main Street, shares words of wisdom from her granny and tells how one superstitious old man could literally make it rain even during the dry, dog days of summer. Each of these people still lives in Atkins’ memory, frozen in time just as they were in the ‘70s. These ghosts of bygone days shine through in the book. Atkins hopes her stories and essays will spark some of the readers’ own memories and that they are transported into a South that is heartwarming, feisty and flat out funny. Audrey McDonald Atkins grew up in the small town of Citronelle and spent her childhood roaming through the piney woods, swimming in creeks and rambling about her small town, taking in the sights and sounds of the Deep South and storing them away. She writes the popular southern culture blog, Folkways Nowadays, sharing her stories and essays about life in the South. Atkins now lives in Birmingham. Visit her online at folkwaysnowadays.com. Simon & Schuster, a company with nearly ninety years of publishing experience, has teamed up with Author Solutions, LLC, the leading self-publishing company worldwide, to create Archway Publishing. With unique resources to support books of all kind, Archway Publishing offers a specialized approach to help every author reach his or her desired audience. For more information, visit http://www.archwaypublishing.com or call 888-242-5904.